We had a one day down-trend last week after the 51 day up-trend ended and now we are back to the first day of a new QQQQ short term up-trend (U-1, click on table to enlarge). The index could go either way. 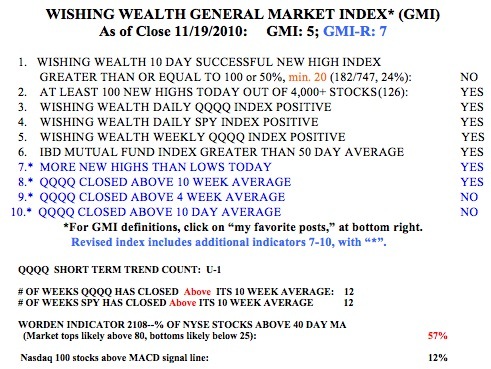 But the QQQQ and SPY longer term trends remain up, having closed above their 10 week averages for 12 straight weeks. So my long term university pension funds remain in mutual funds. My trading accounts are mostly in cash or in QLD (the ultra long QQQQ ETF) right now. The stochastics for the QQQQ reached oversold levels last Thursday and the market rallied. I need to see if this rally can hold on a few more days to be confident of this new short term up-trend. Note that only 12% of the Nasdaq 100 stocks closed Friday with their MACD above its signal line, suggesting short term weakness. The T2108 indicator, at 57%, is in neutral territory, but the Investors Intelligence poll shows few bears and many bulls.